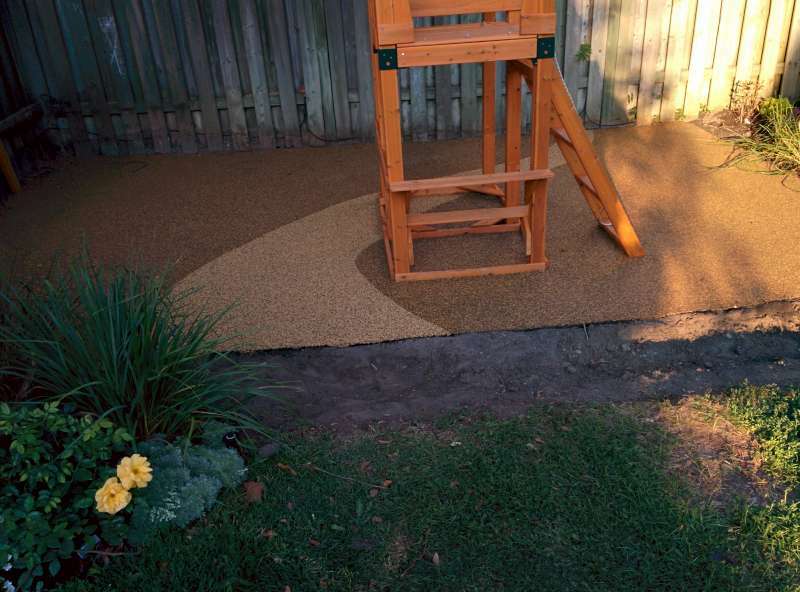 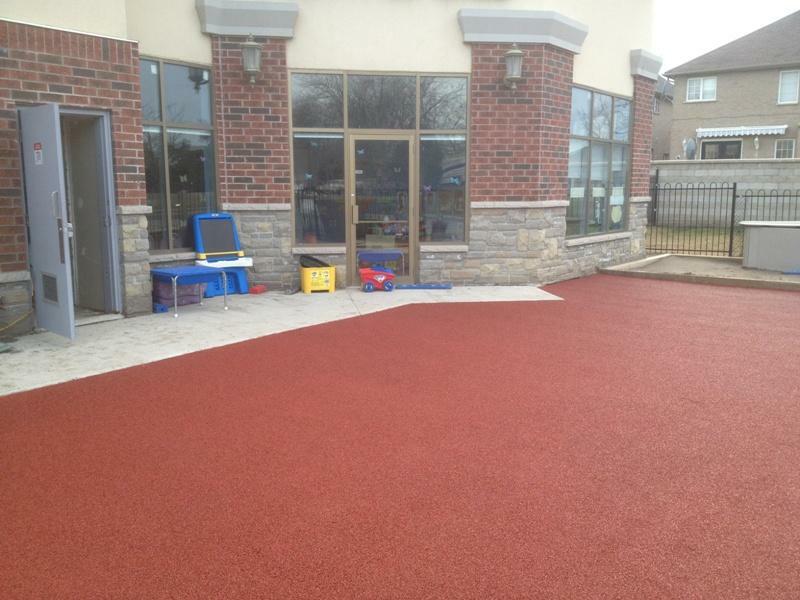 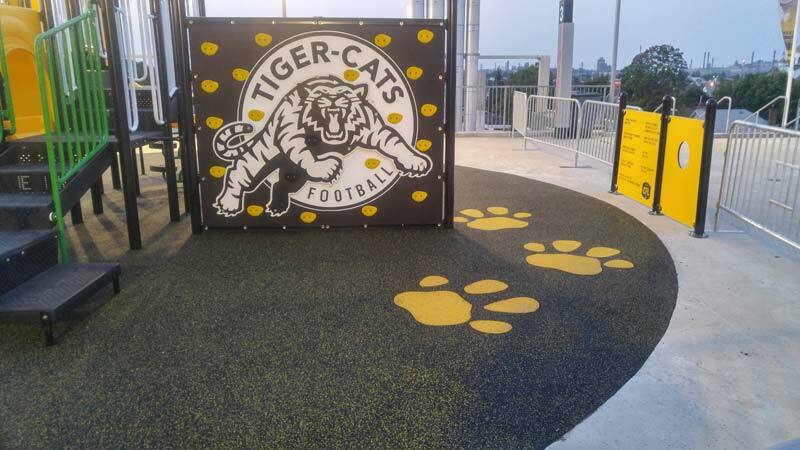 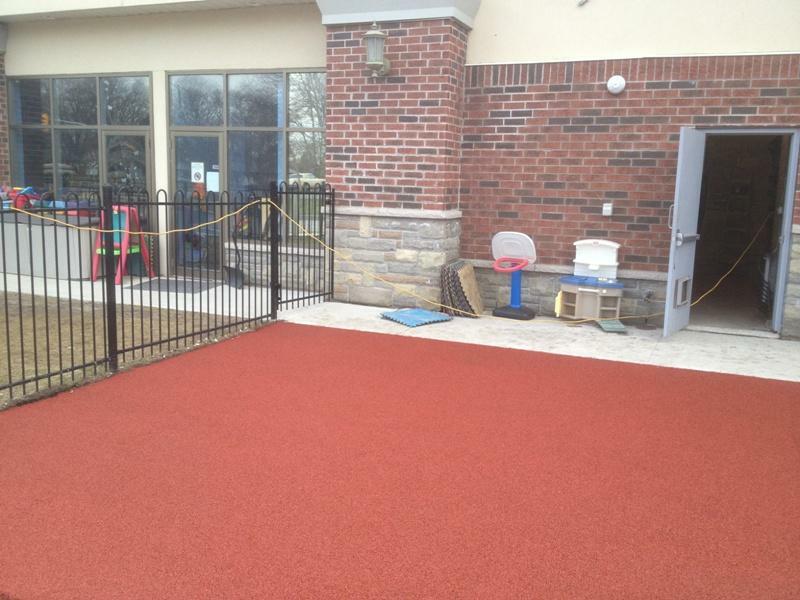 Premier Custom Surfacing inc Installs a highly durable, Ontario Certified Safety Surface. 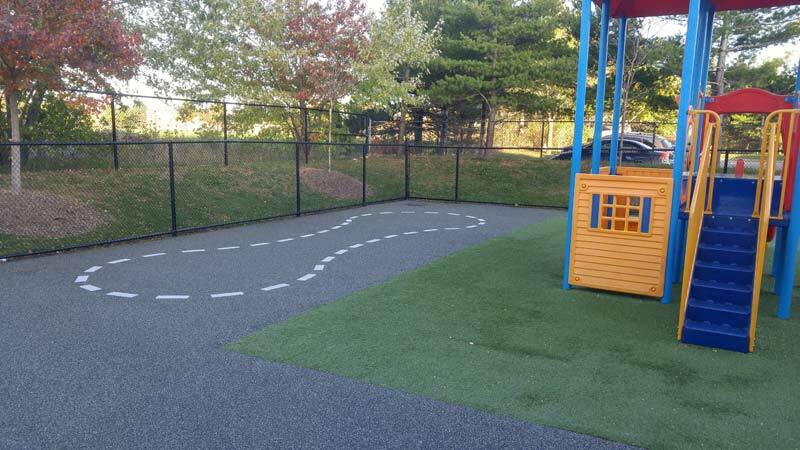 It is a U.V. 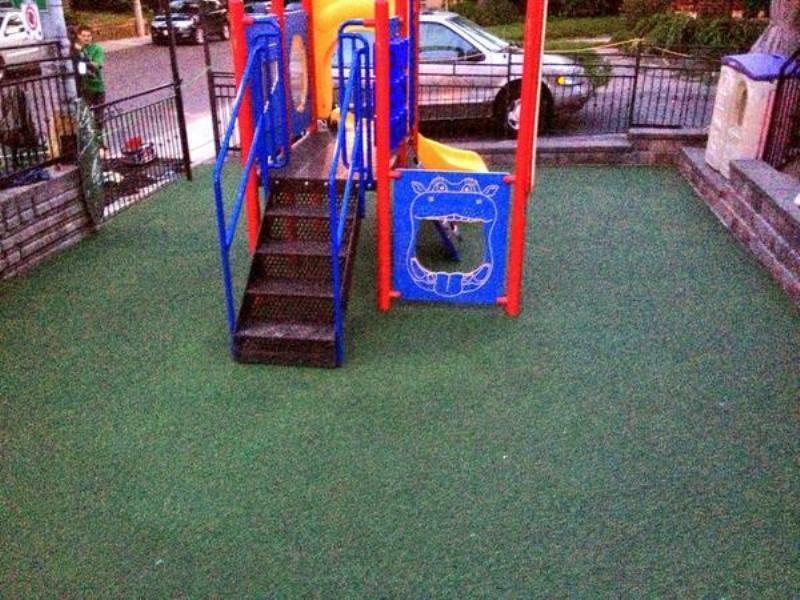 stabilized, non-toxic, anti-fungal, ice and slip resistant rubberized surface. 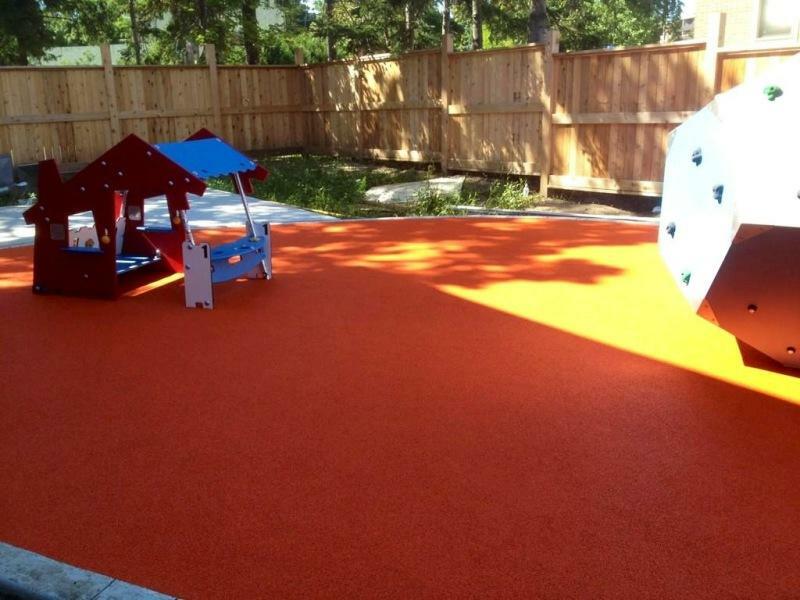 Custom colors, patterns, games, and educational objects can be easily incorporated to enhance the appearance and educational value of your play area. 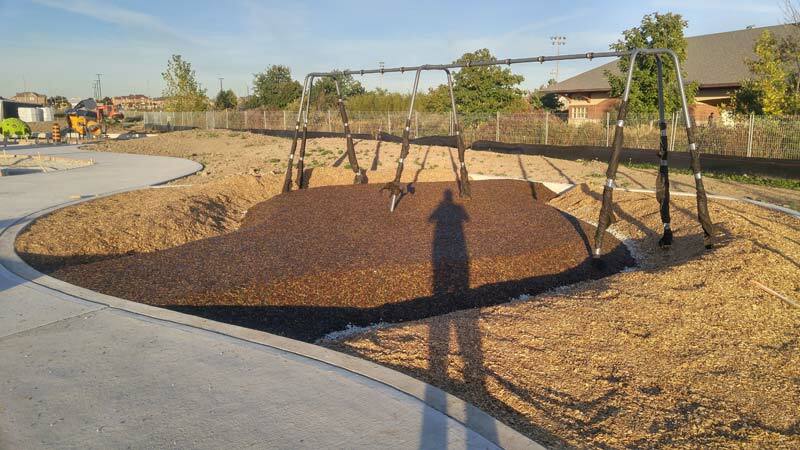 Our playground surfaces exceed all standards for impact attenuation under and around playground equipment meeting all G/Max and HIC values. 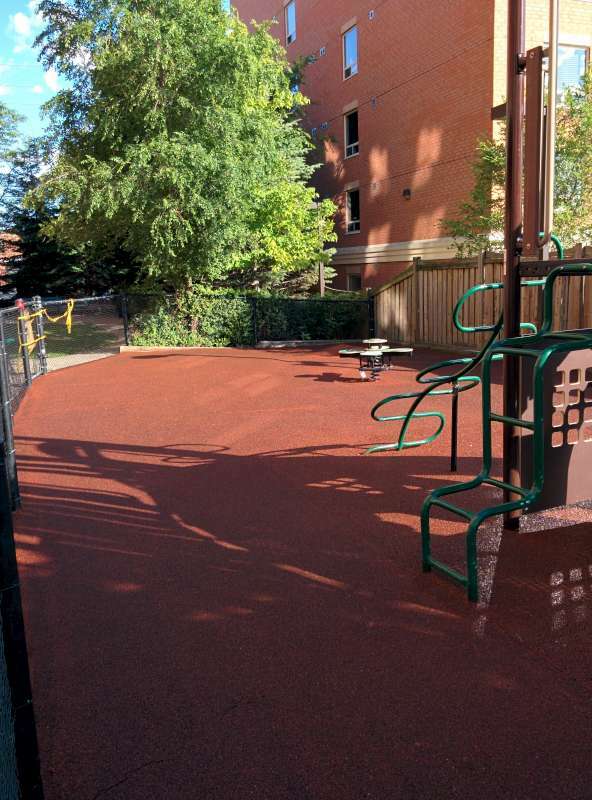 All of our surfaces meet or exceed C.C.P.I. 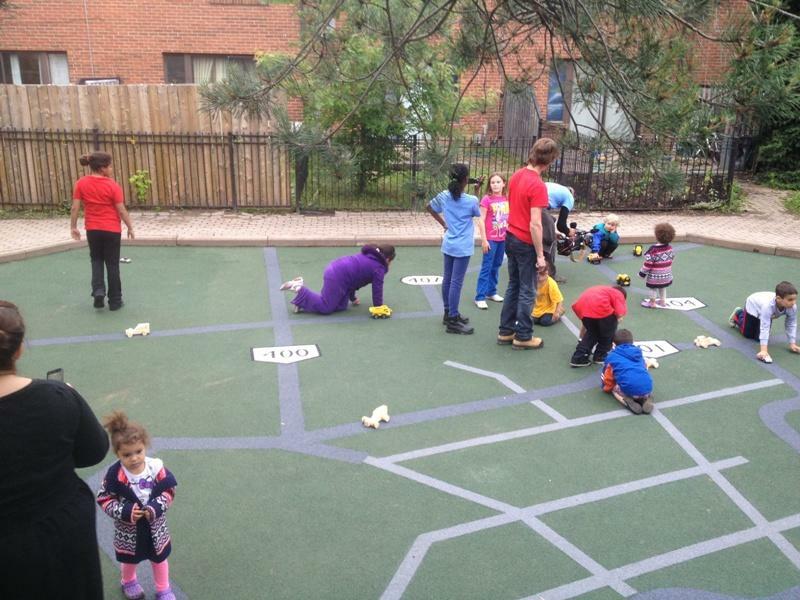 (Canadian Certified Playground Inspectors) and R.P.P. 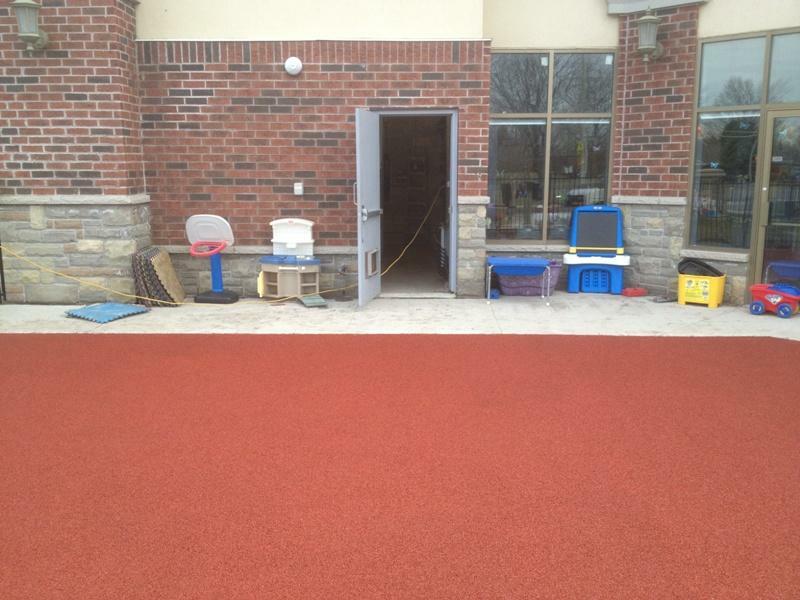 (Registered Playground Practitioners) standards for rubberized surfaces. 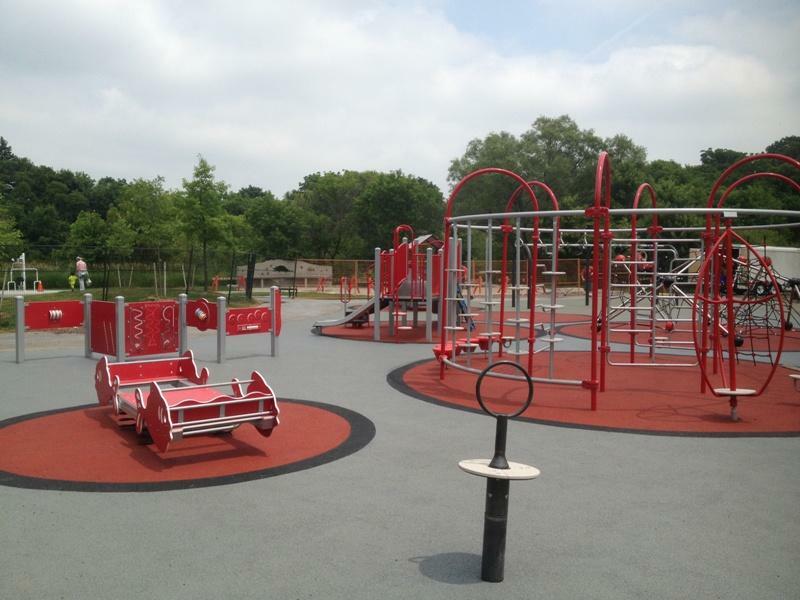 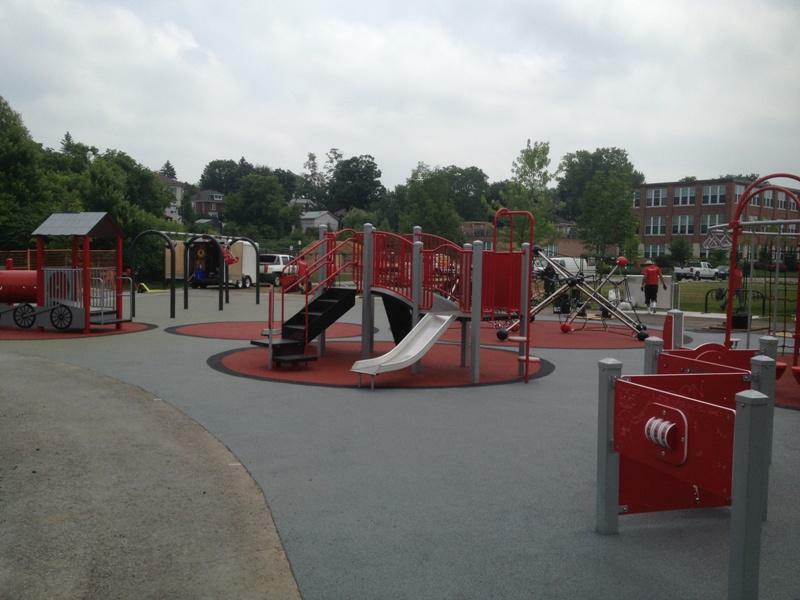 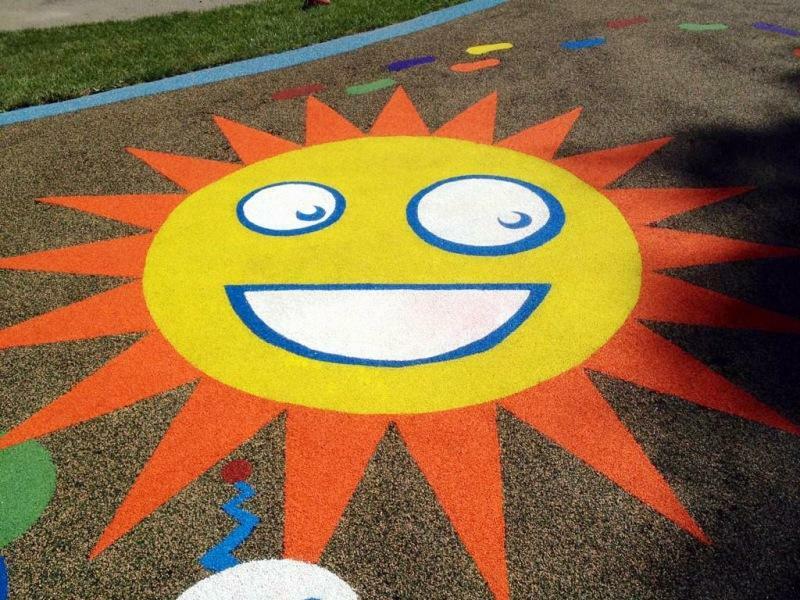 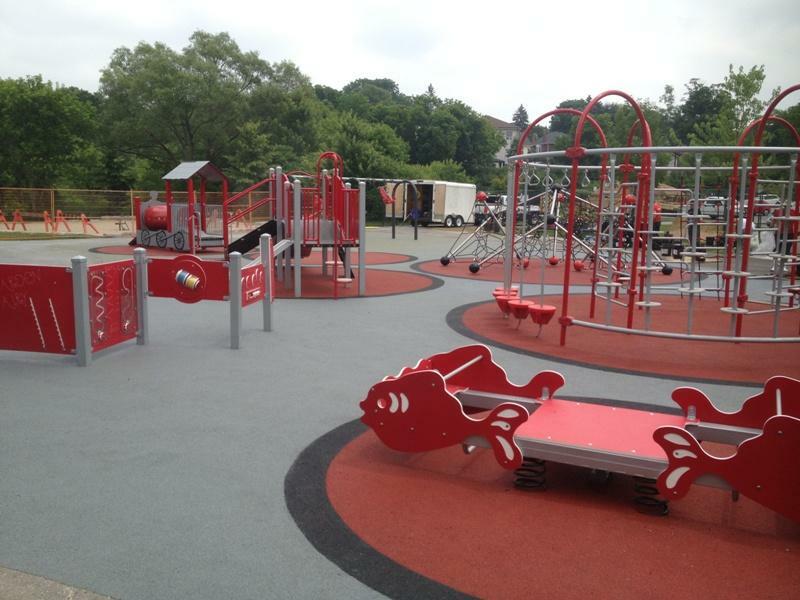 Our surfaces have been tested to meet all standards on children's play spaces and equipment. 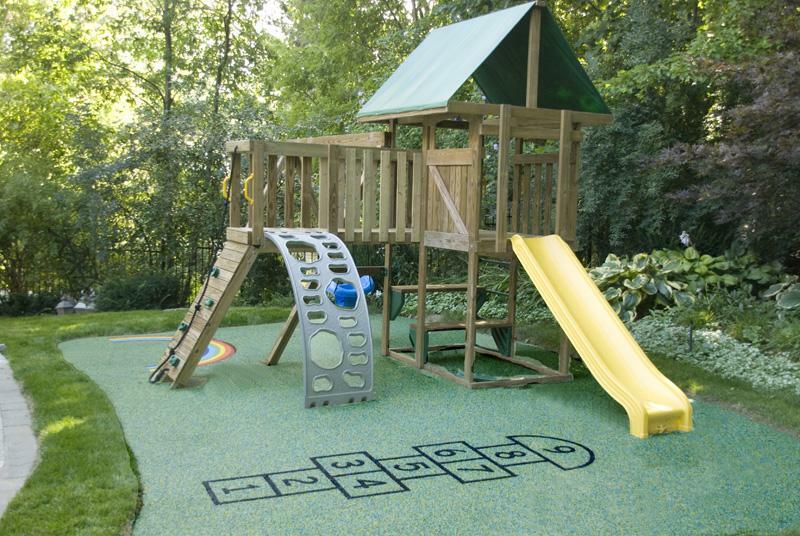 Details: A custom designed play area for the children of the family. 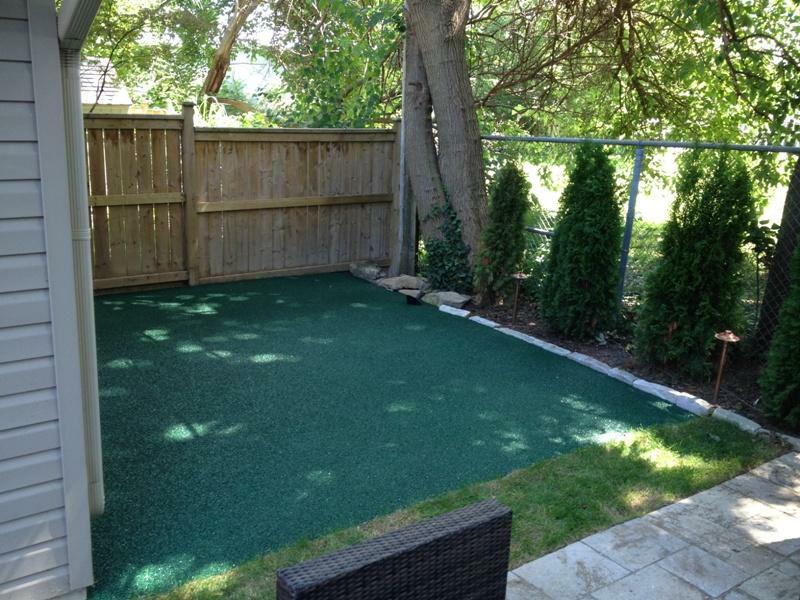 The grass was removed and replaced with granular aggregate to create a solid base with proper drainage. 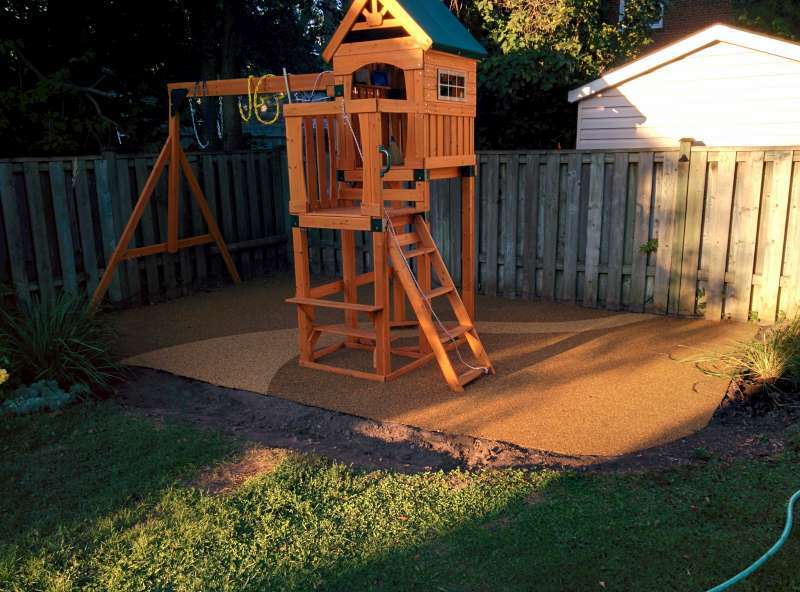 Next protective layer of SBR rubber was applied to create a fall safe and impact absorbing layer. 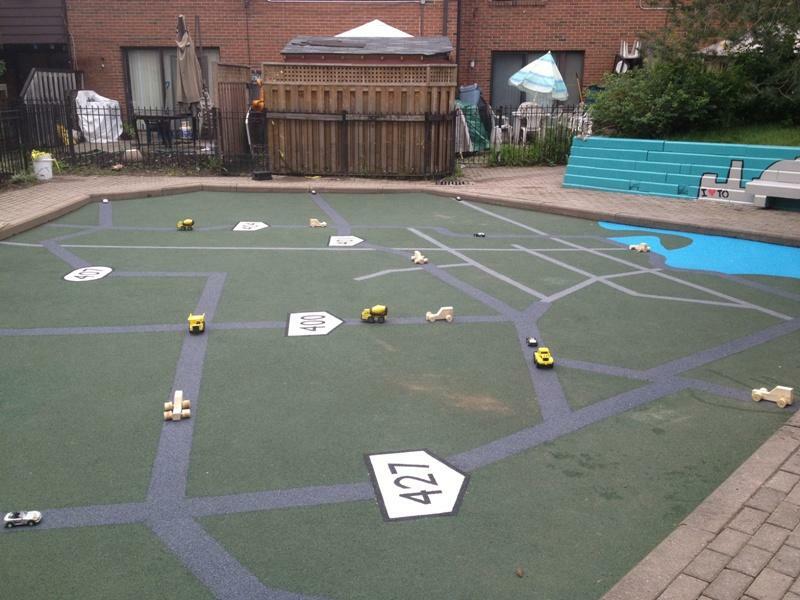 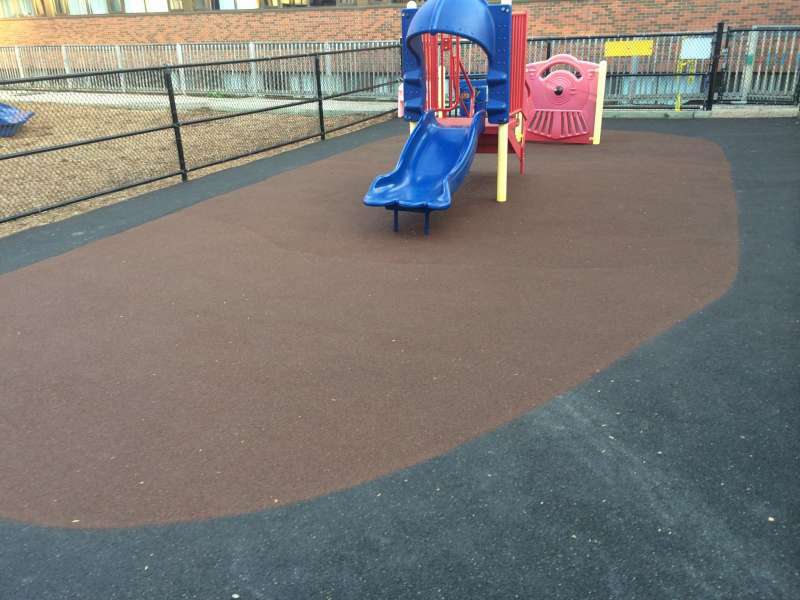 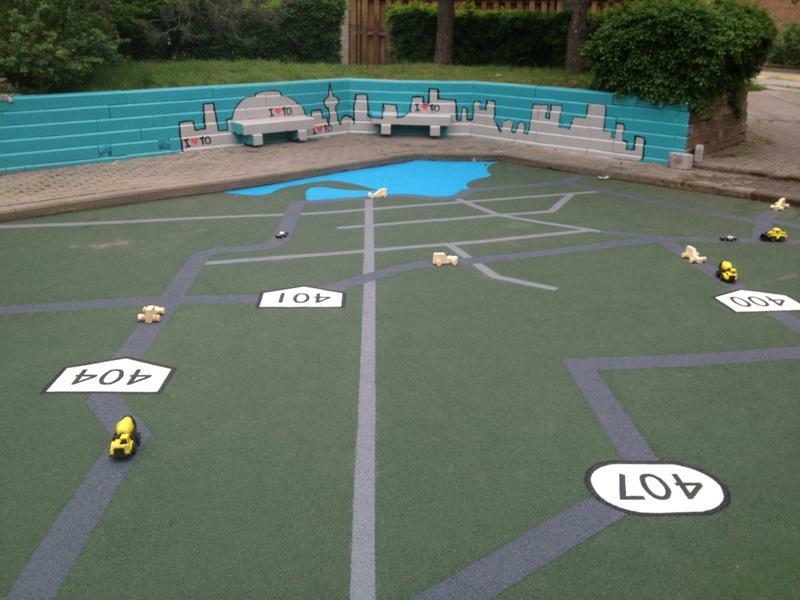 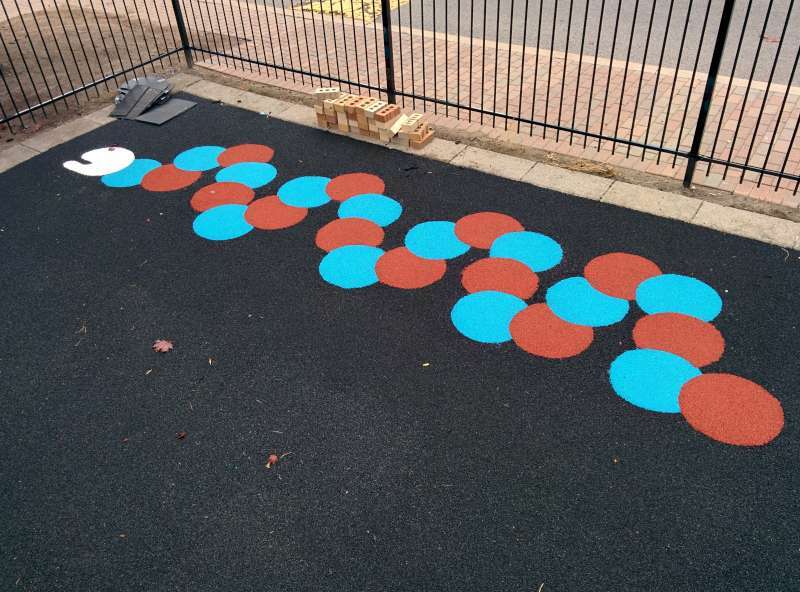 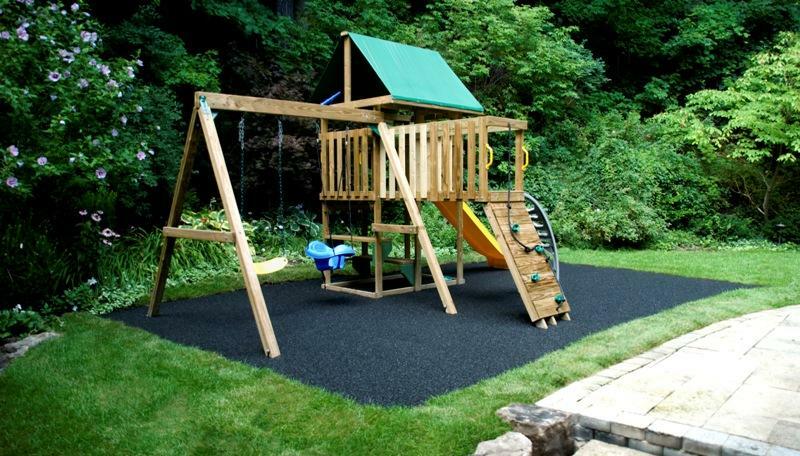 Next a coloured EPDM wear coat was applied and designs were inlayed into the surface for play value. 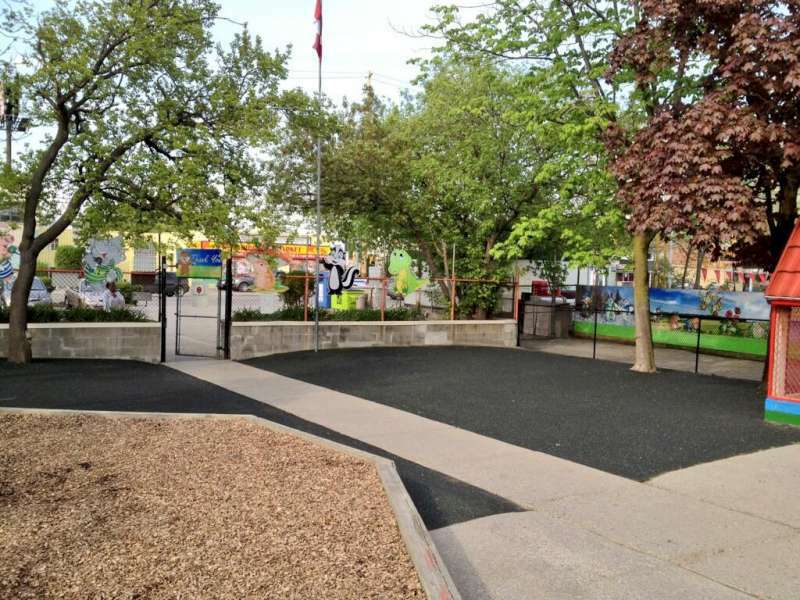 Details: This custom designed playground was created for the TVO television show "Giver" Designed for the community centre to allow the local kids a safe and fun area to play. 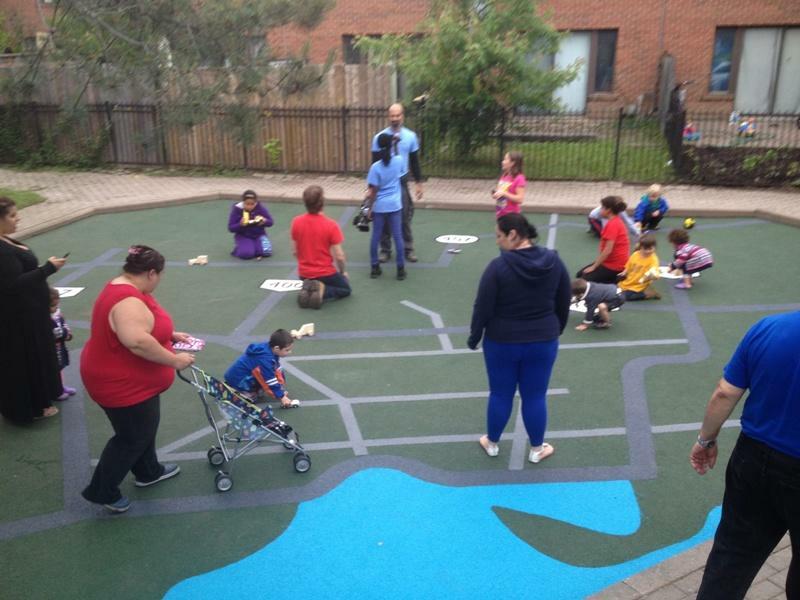 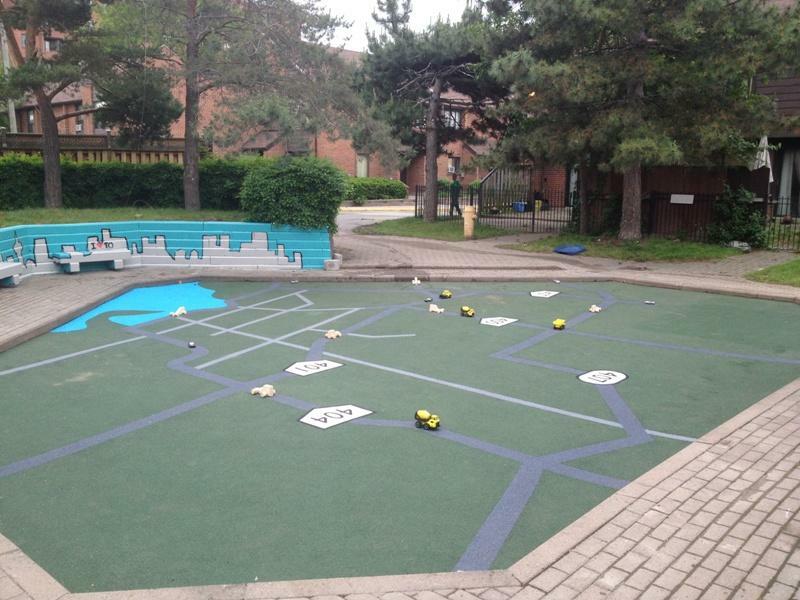 The surface is a large version of the Toronto road map, complete with highways and roads that lead to the community centre. 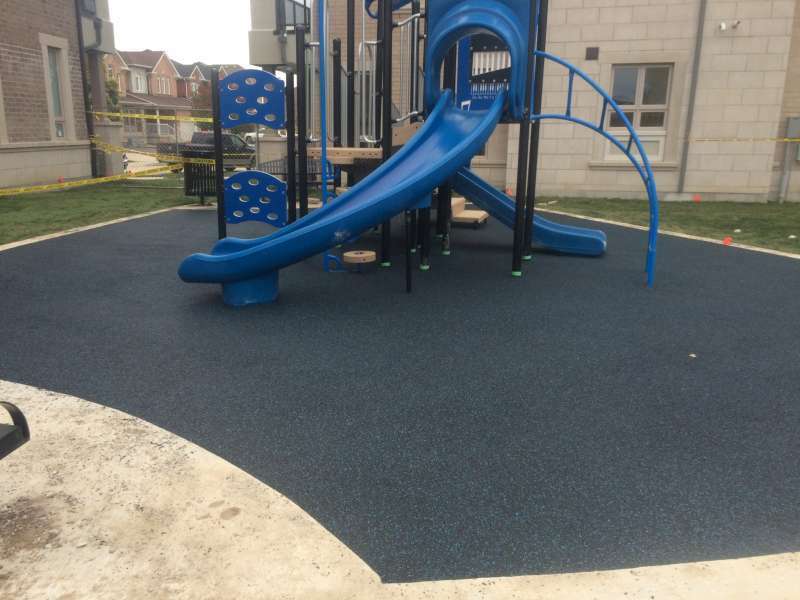 Details: Fall safe, HIC (Head Impact Criteria) and ASTM Certified playground created for the city of Newmarket. 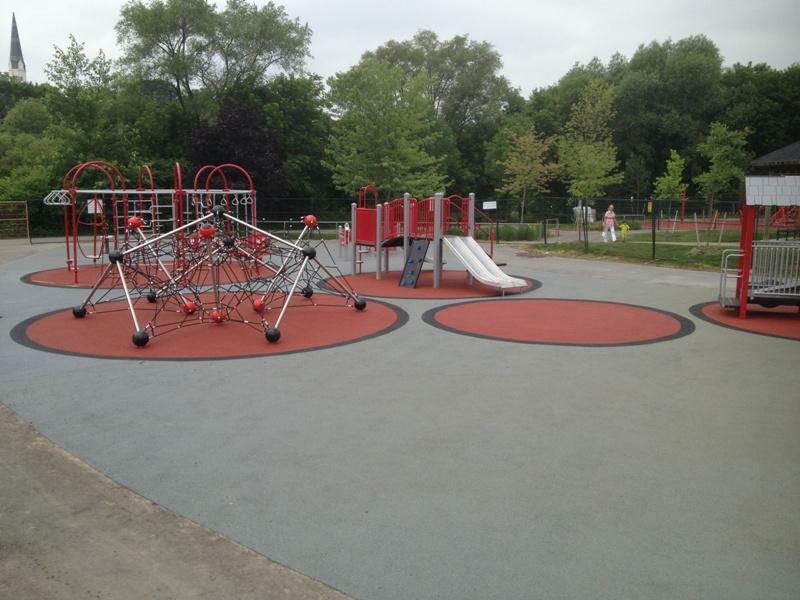 One of the largest playgrounds in Newmarket the “Dinosaur Park” is a local favourite of both parents and children in Newmarket. 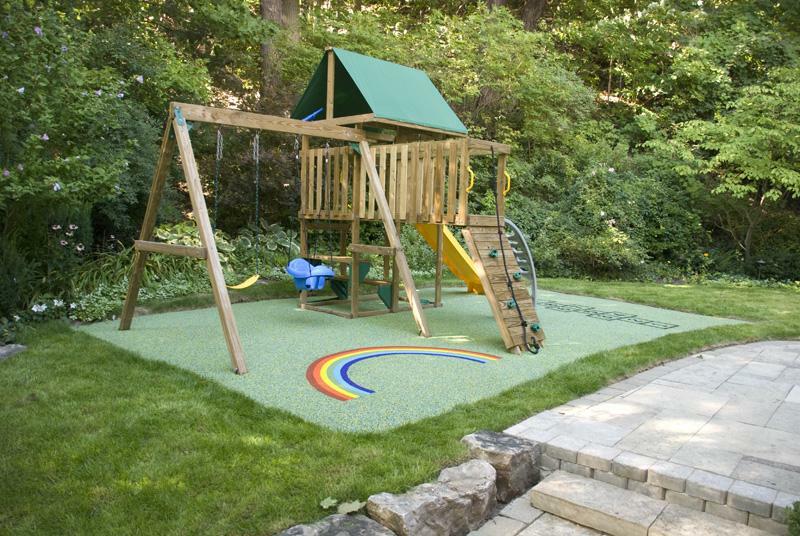 Fall safe up to 10 feet and with design features to create a fun environment to play in. 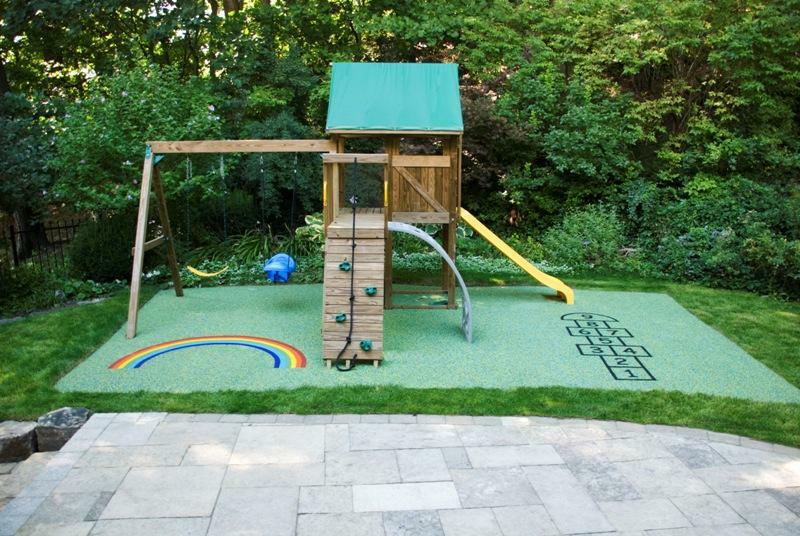 Details: SBR Rubber combined with dyed green resin was used to create this safe and beautiful backyard area. 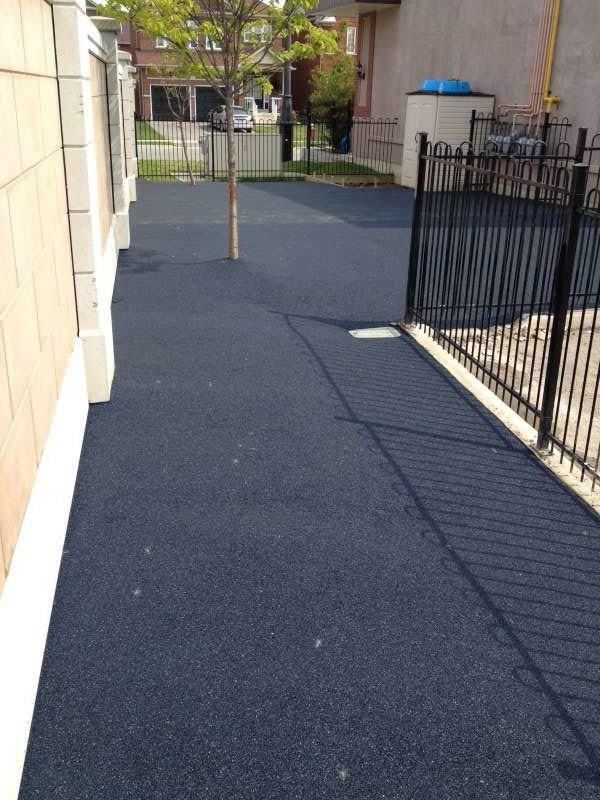 A granular aggregate base was installed for proper drainage and stability and then was resurfaced with dyed SBR rubber. 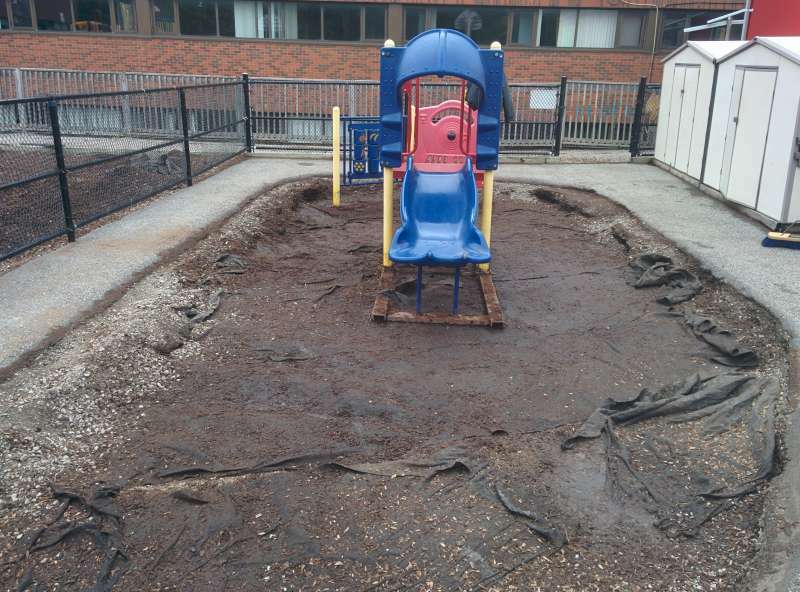 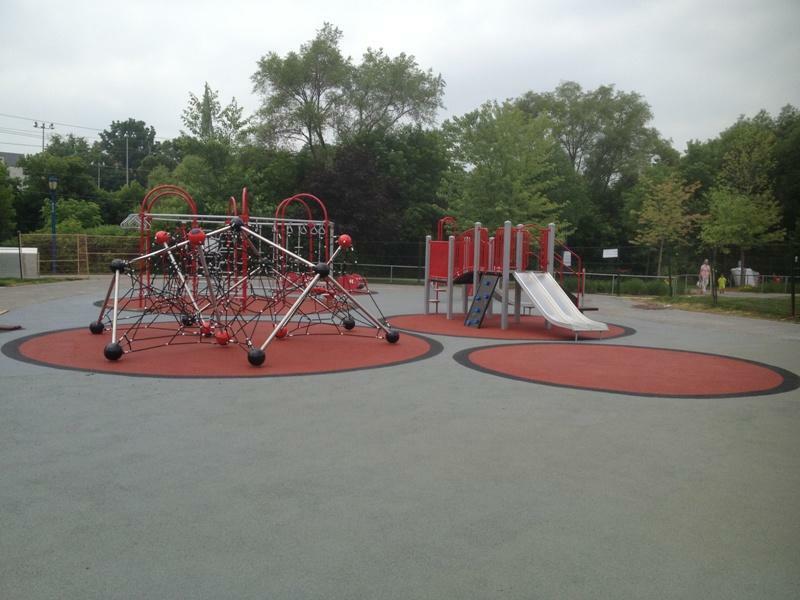 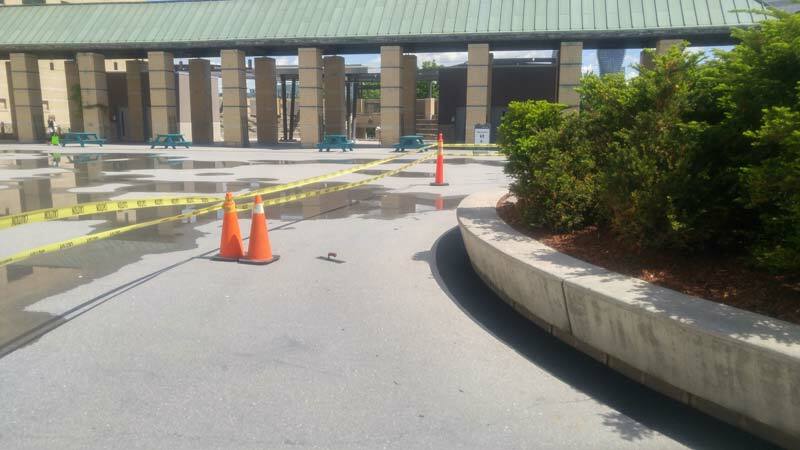 Details: New play equipment was installed and required the removal of large sections of the rubberized safety surface. 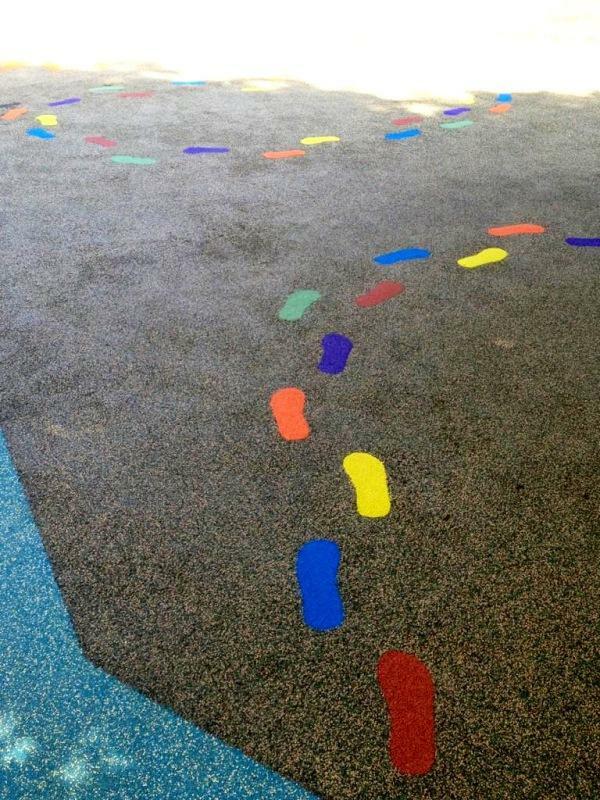 They were replaced with SBR rubber and Dyed resin colour matched to the older surface. 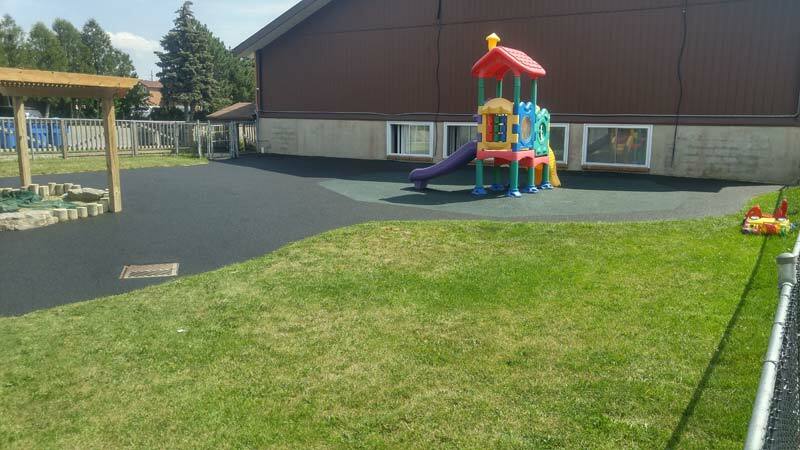 The whole area was then revitalized with a dyed resin roller coat to add strength and a fresh new appearance. 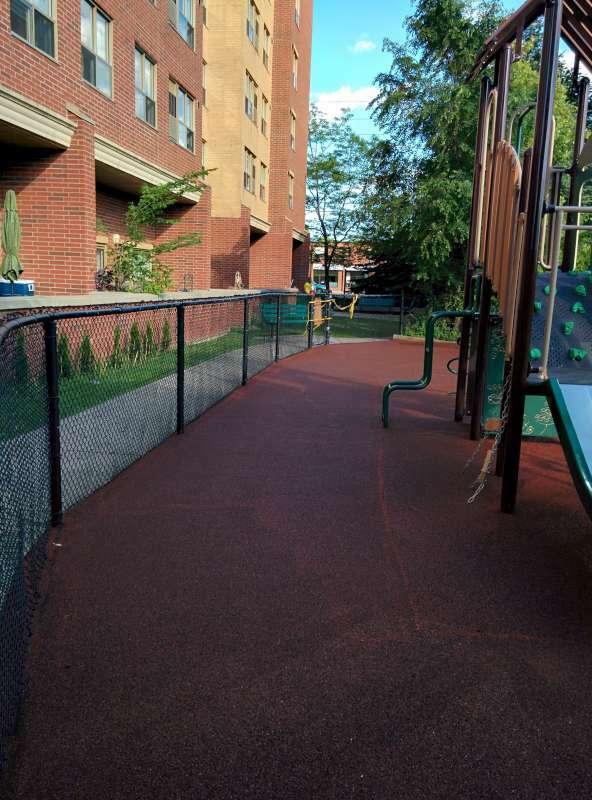 Details: A Fall safe ASTM and CSA Certified playground for a condo community. 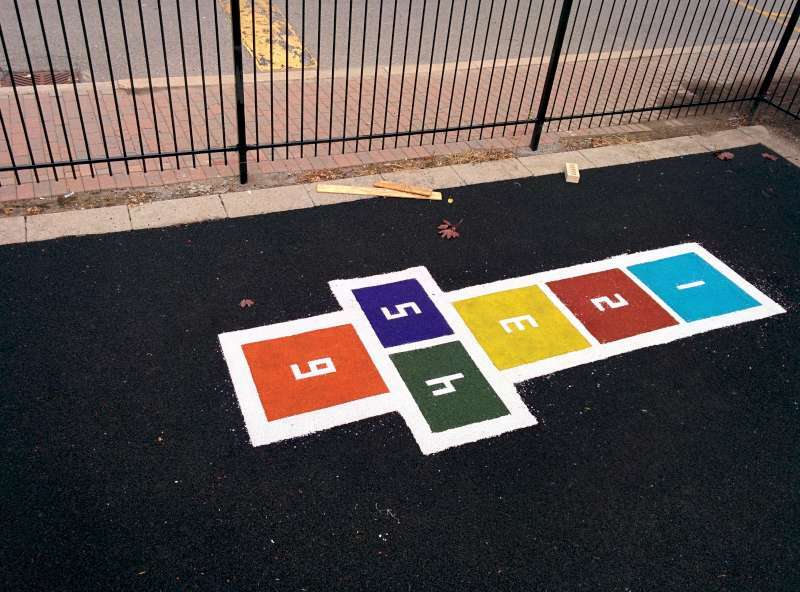 Created with SBR impact absorbing base and finished with a colourful EPDM caterpillar and multi coloured hop scotch for added play value. 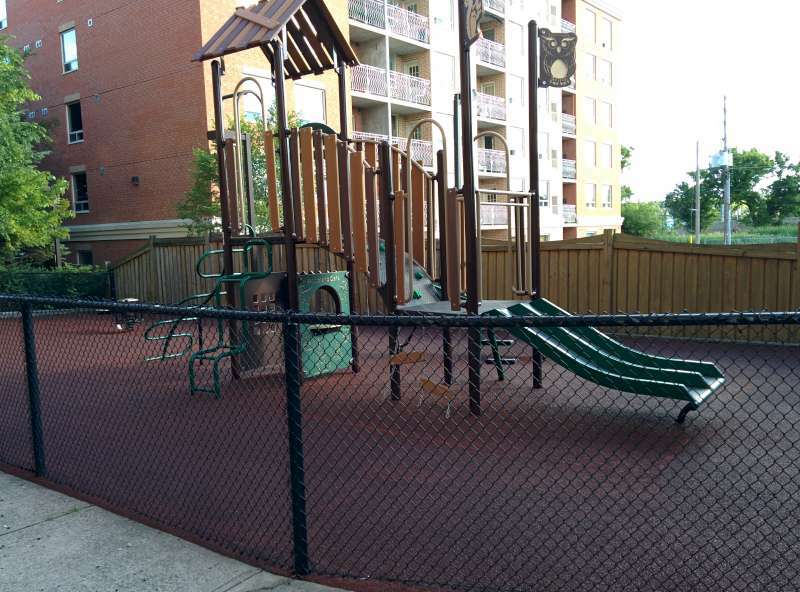 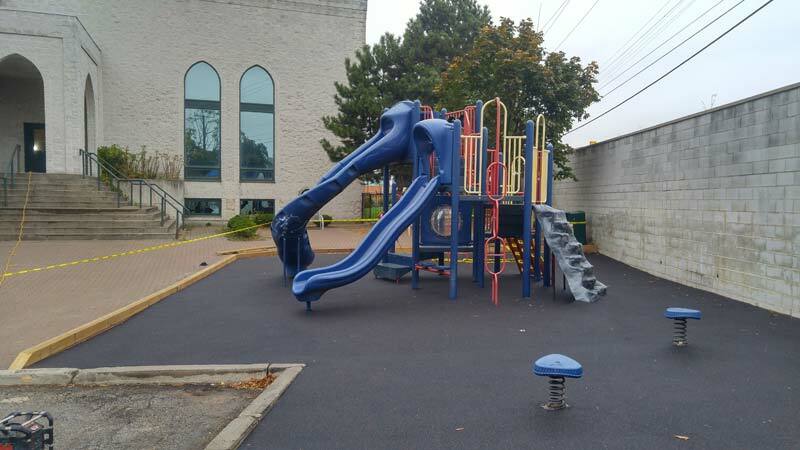 Details: Fall safe ASTM and CSA Certified playground for a daycare located in Toronto. 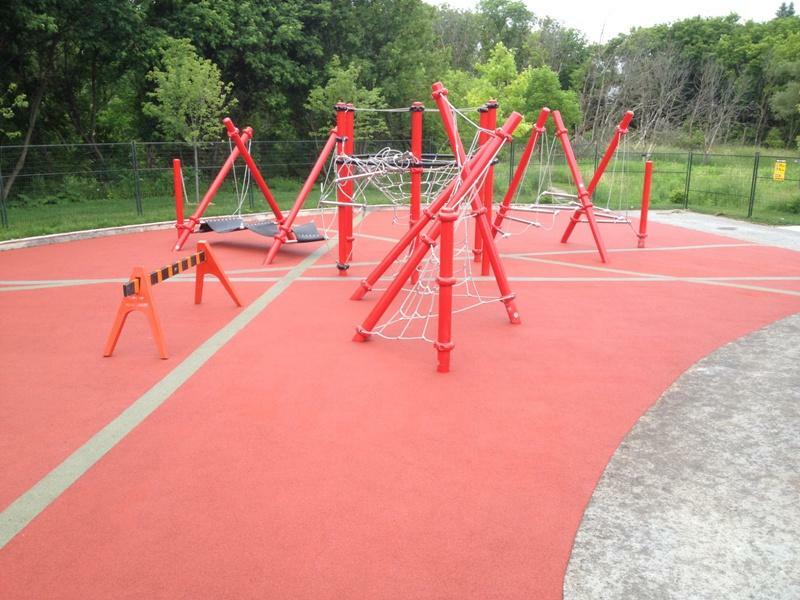 The Interior red area was created with a 6-8 foot fall height impact absorbing surface and was then surrounded with a slip resistant black walkway. 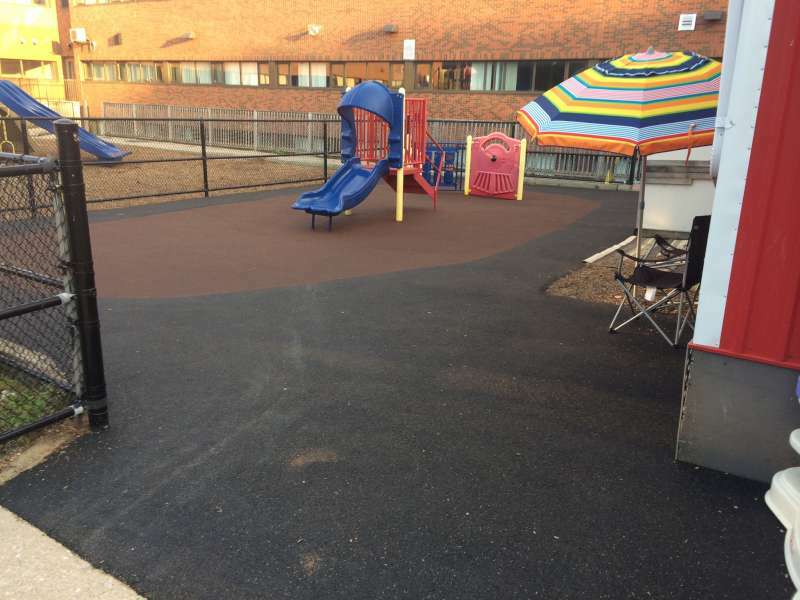 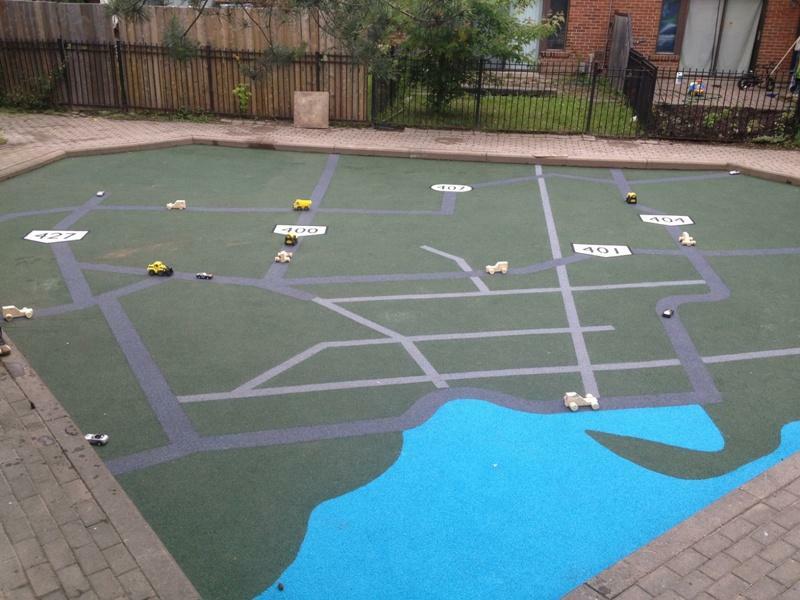 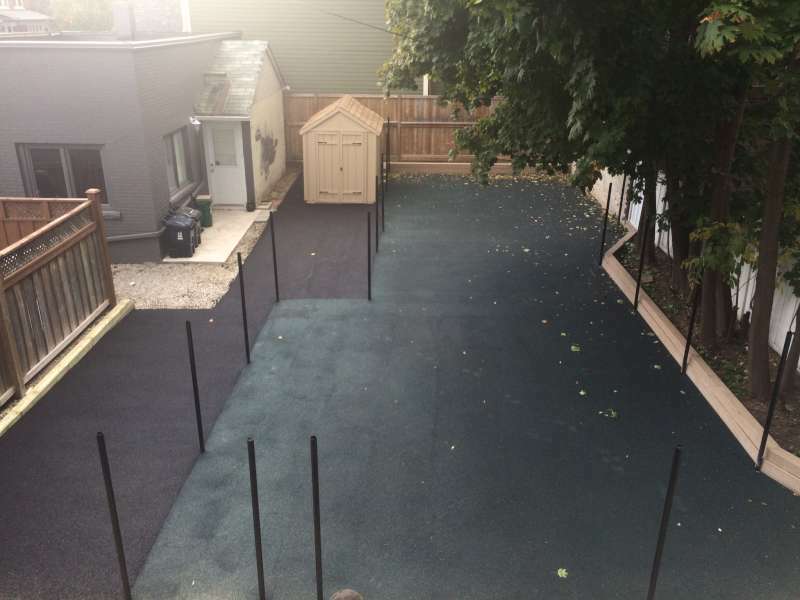 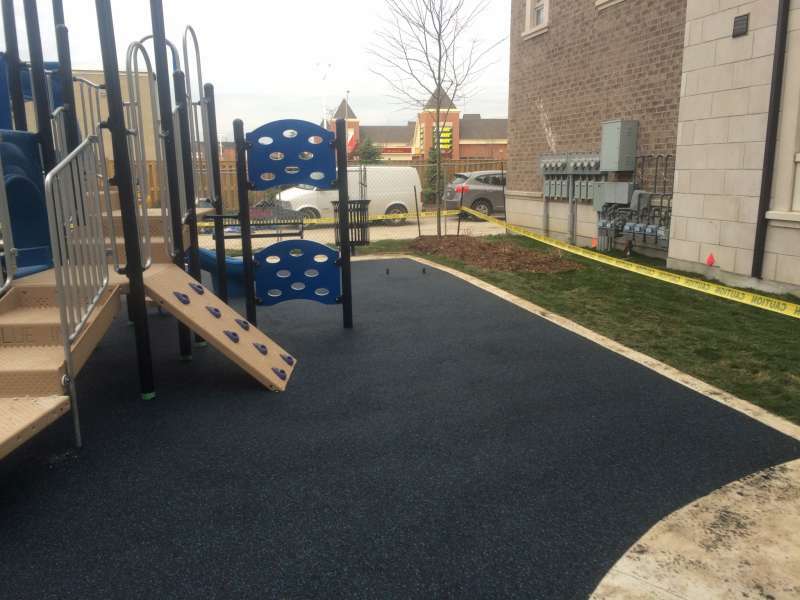 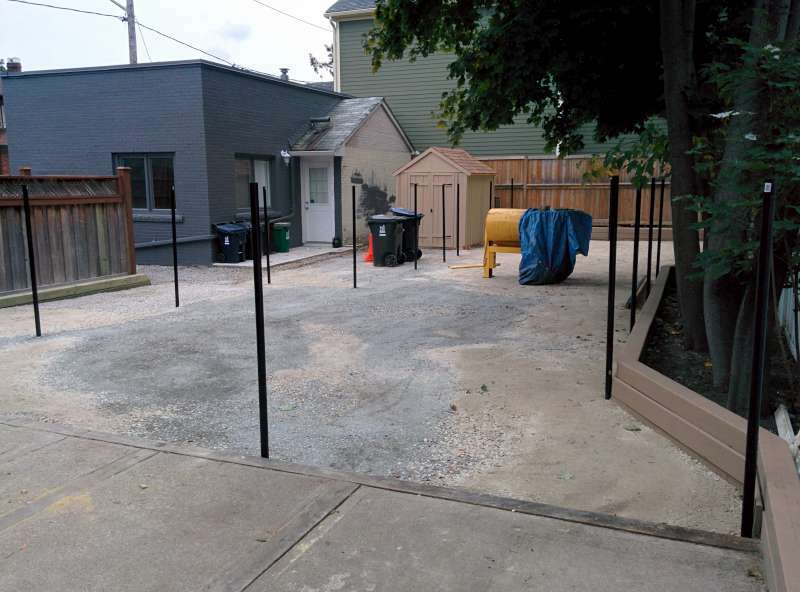 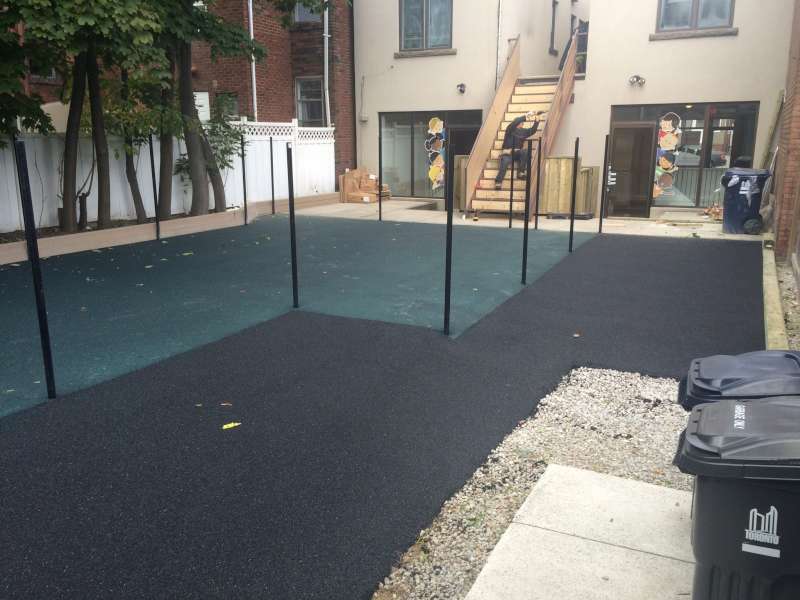 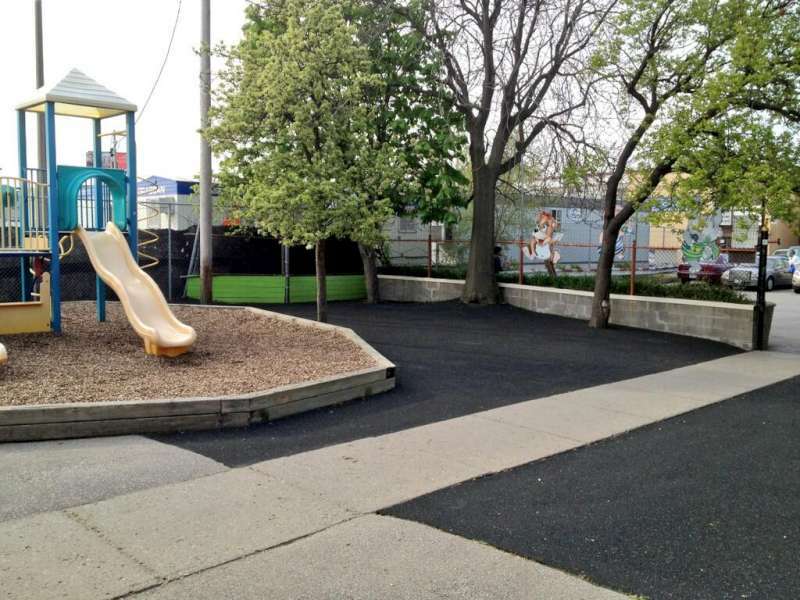 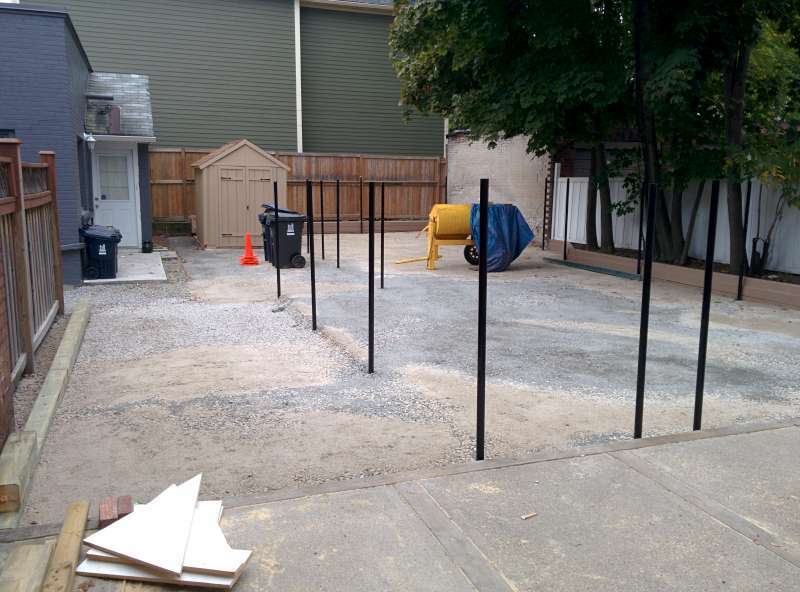 Details: A newly constructed daycare in Toronto needed to change their gravel and outdoor carpet into a safe and fun place for the kids to play. 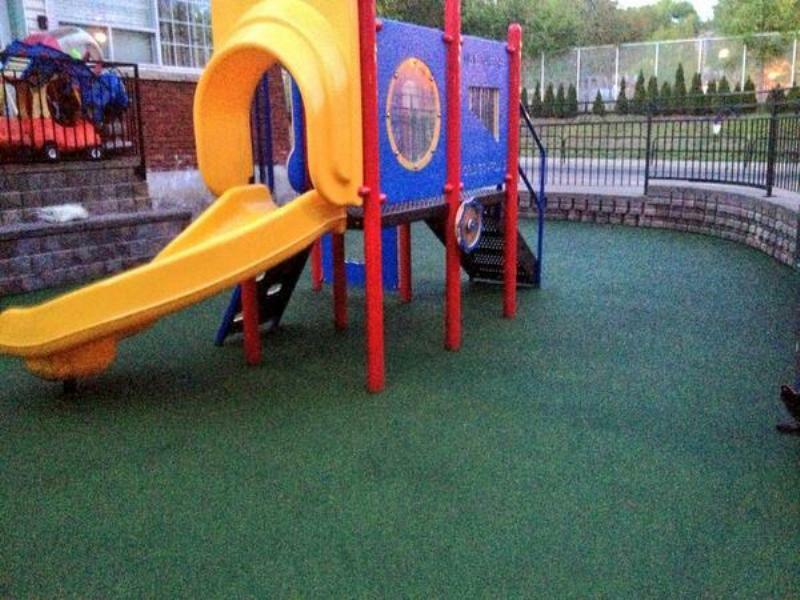 We created a hunter green resin to match the daycares colour scheme and then created a black walkway around the perimeter for safe and easy access to the play area. 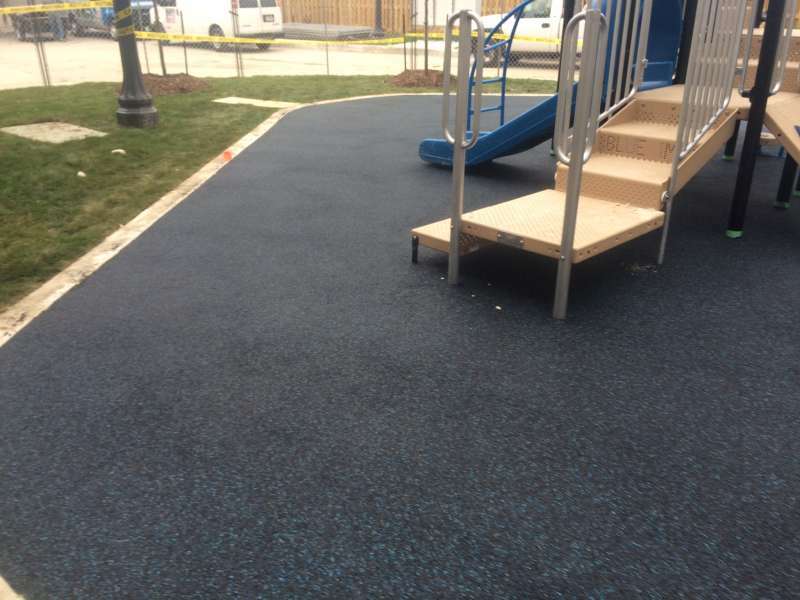 Details: A newly constructed condo complex with a centrally located playground for the families was built using SBR and EPDM rubber. 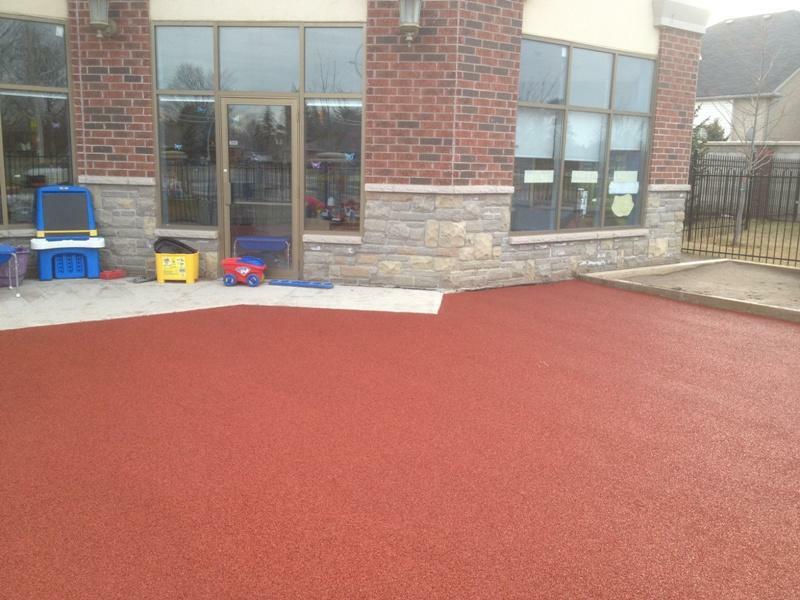 This job has been nicknamed “Blueberry” as the addition of a blue flake really adds to the appearance of the surface. 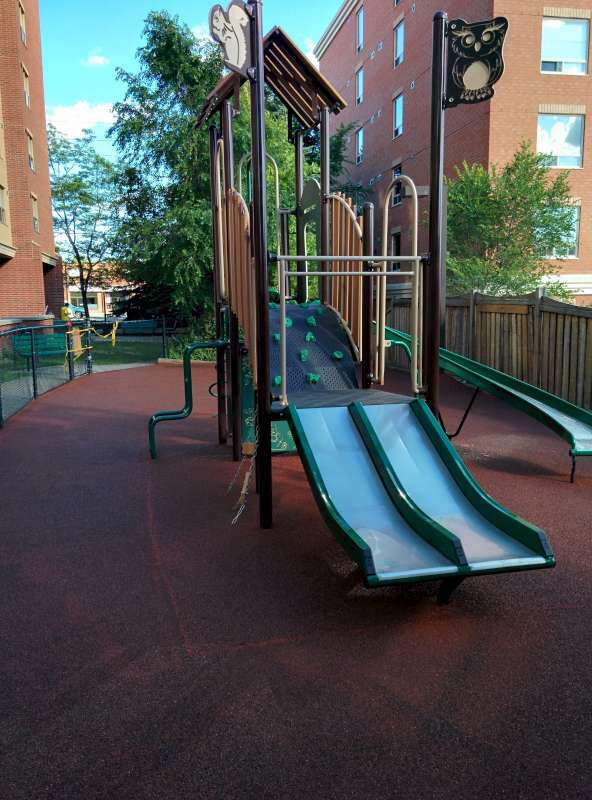 Created to meet all ASTM and CSA guidelines for fall height and HIC criteria, this playground will be fun and safe for the whole community. 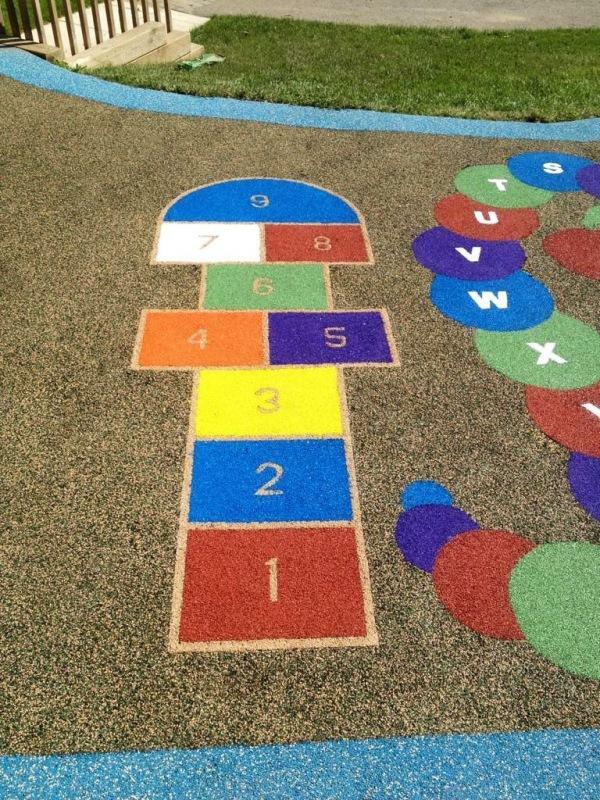 Details: This playground was created for a family with growing children and an eye to the future. 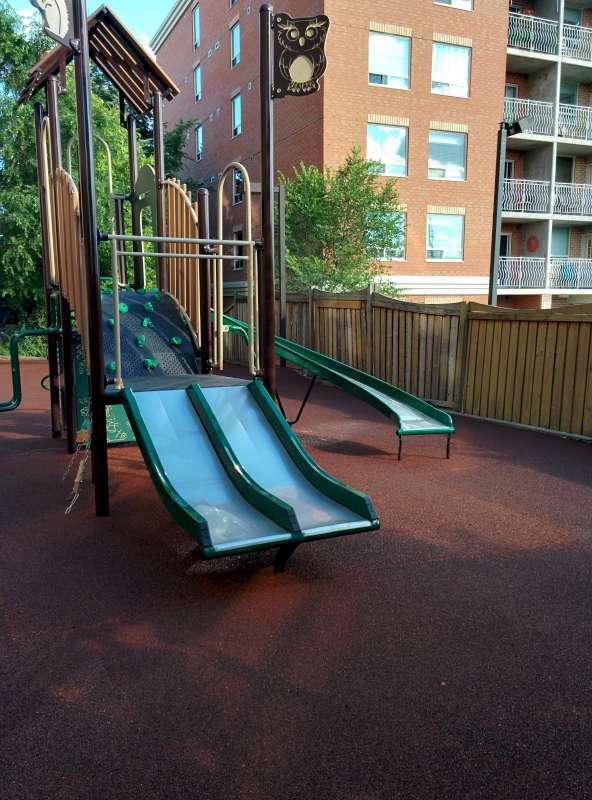 Fall safe and fun for the kids right now, and attractive for the adults when the kids have grown up and the play equipment is replaced with patio furniture. 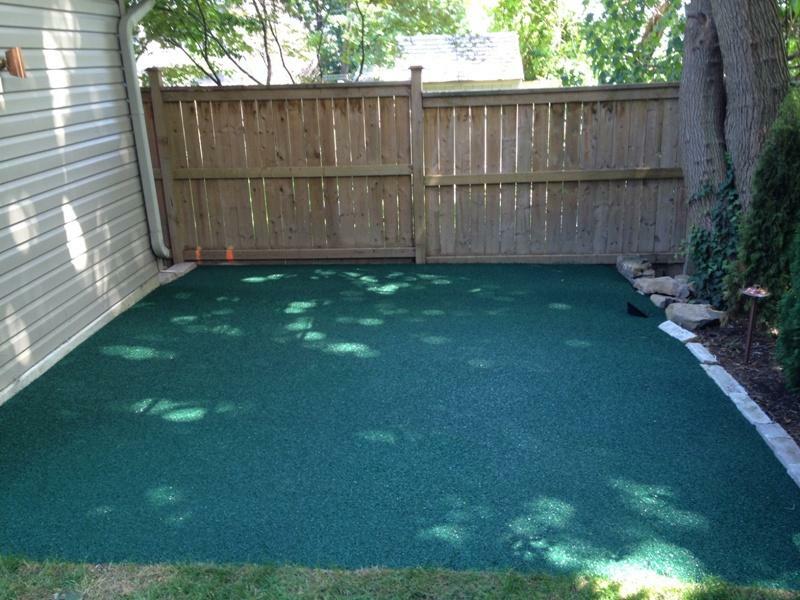 The grass was removed and replaced with a granular aggregate for proper structure and drainage. 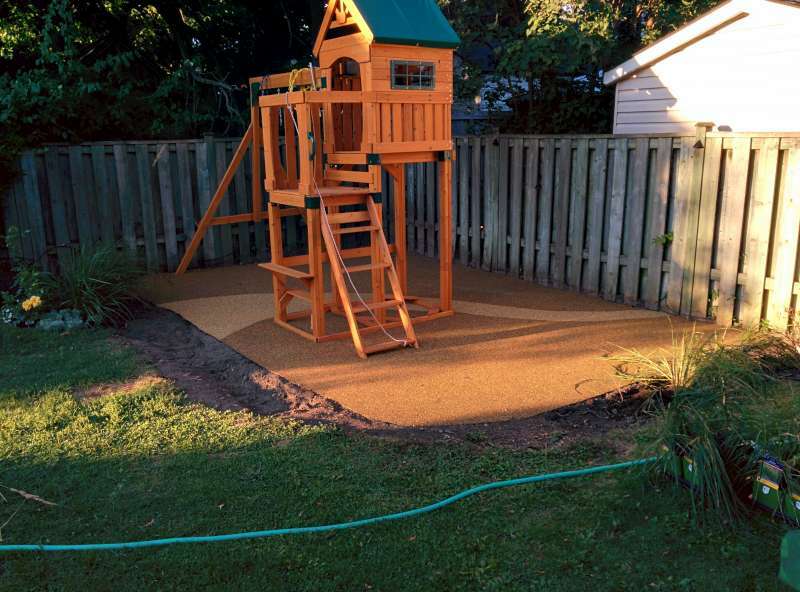 Next a layer of SBR was used to create a level and safe surface. 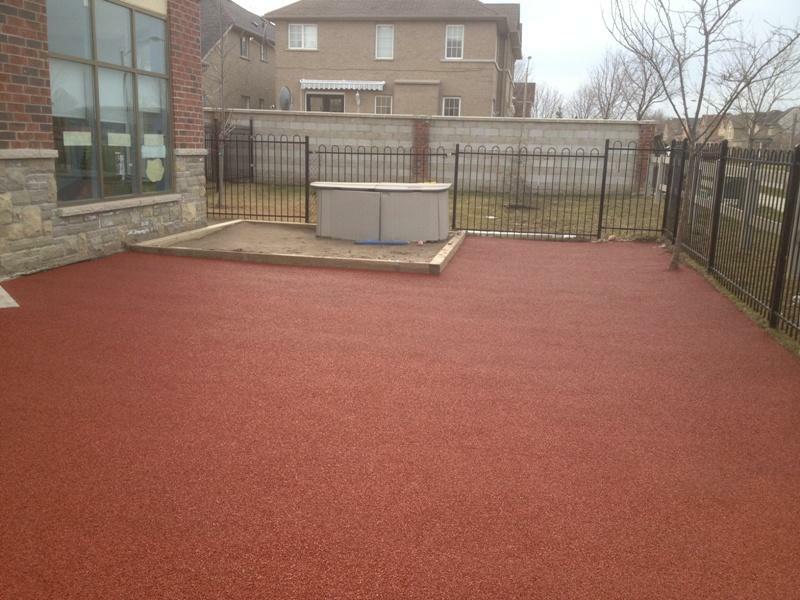 Finally the EPDM colour coat was installed and the pattern inlayed to create this one of a kind surface. 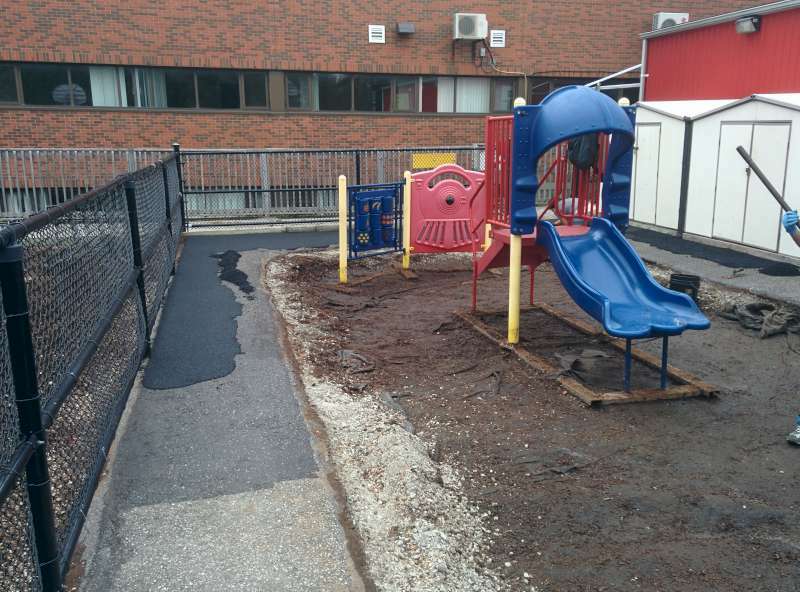 Details: This daycare facility had been suffering from water logged play areas in the summer and unusable iced over play areas in the winter. 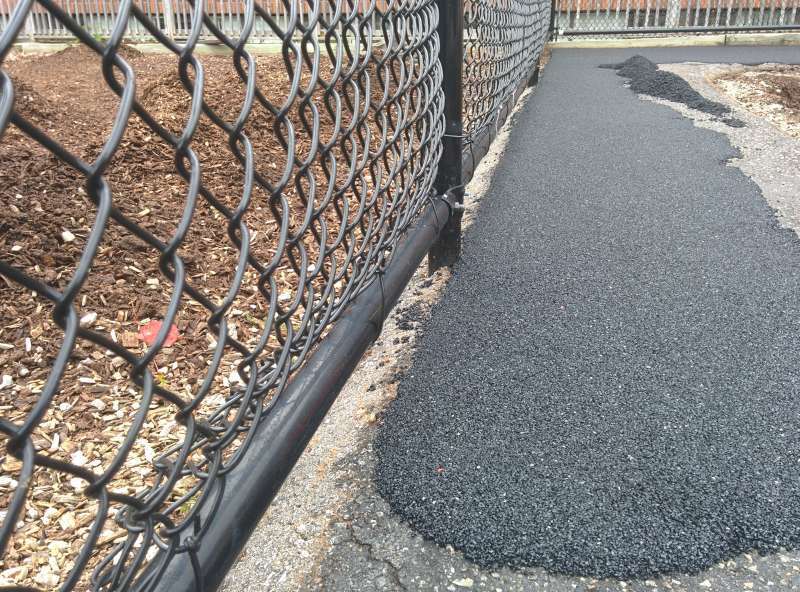 Proper drainage was installed and the surface was graded and compacted to create a long lasting base. 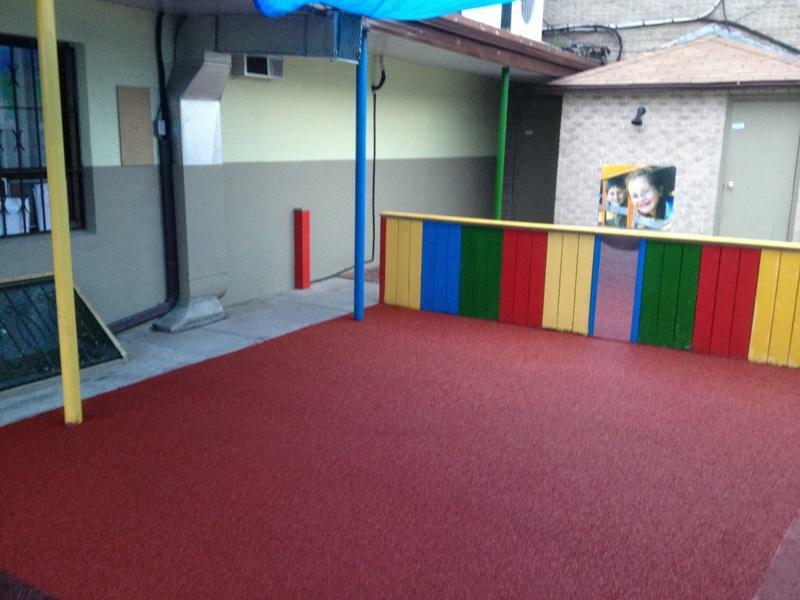 Then the area was resurfaced with SBR Rubber and Red Dyed resin to match the daycares colour scheme.